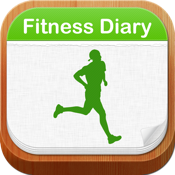 The Fitness Diary is your private slimming assistant, we aim to help you a reasonable, healthy, effective weight-loss. Today, sports a long, consume how many calories? Spring, something delicious and not gain weight? All of which can be found in the Fitness Diary,Fitness Diary is a professional weight loss software tailored for your health thin, perfect body shape. Record your weight-loss progress at the same time, giving you the most appropriate weight-loss recommendations and provide you with the most professional weight-loss services. Record weight. Record daily weight. Record of the daily diet. Breakfast, lunch, dinner, snacks, etc. can be recorded separately, one input, multiple inputs can be, the day's records can be amended at any time. Record daily exercise time and calories burned. Selected for their sports, and sports results are automatically recorded in the diary. Record daily mood. Record in the weight-loss journey, every day of the feelings and experiences, to become a valuable asset in the memory. Thin in a variety of alternative sports, and recommend the appropriate exercise time you can continue to exercise after the completion of the exercise, assignment, we will all sports exercise time and exercise burns calories statistics, the final results of the movement, automatically included in the diary of personal progress. A daily record of weight values ​​and diary for your exclusive draw weight change curve, in the above you can view the weight change in the weight-loss process, you can view the day's weight and detailed diary. View the current week in January and the current weight change. We provide you with a more typical types of food calories, you can easily view, facilitate the calculation of the Add button to add the quantity of food and food calories library also continue to add and improve the be in the path, and strive to ensure that users of the food can be found. You can add a variety of food for the calculation of heat, to facilitate the view of the daily dietary energy. To provide you with a variety of slimming methods, including a variety of weight-loss food, fattening foods, the four seasons health care coup, and a variety of errors lose weight, rich in content. The appearance of a professional design team on the software interface, user experience, exquisite design, and do our utmost so that the user is satisfied with.